Peppermint Eggnog Cupcakes combine two favorite holiday flavors in one delectable treat! It’s officially the holiday baking season and I’m thrilled that I can finally start sharing the rest of the Christmas-y and festive treats I made back in October. You might remember that my insanely enthusiastic husband puts up our Christmas tree every year immediately after Halloween. In the past, I’ve always tried to tell him to hold back but now that we have two little ones who squeal with excitement every time we turn on the Christmas lights, I have learned to just go with the flow. 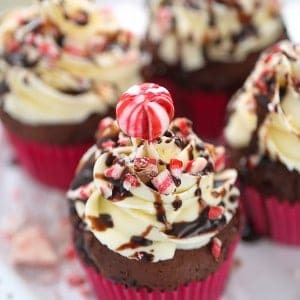 Since I had so much fun making these Peppermint Mocha Cupcakes, this time I decided to marry two favorite holiday flavors into these Peppermint Eggnog Cupcakes. At first I wasn’t sure how the flavors would mesh but just one bite of these cupcakes sent my husband straight into Christmas bliss. 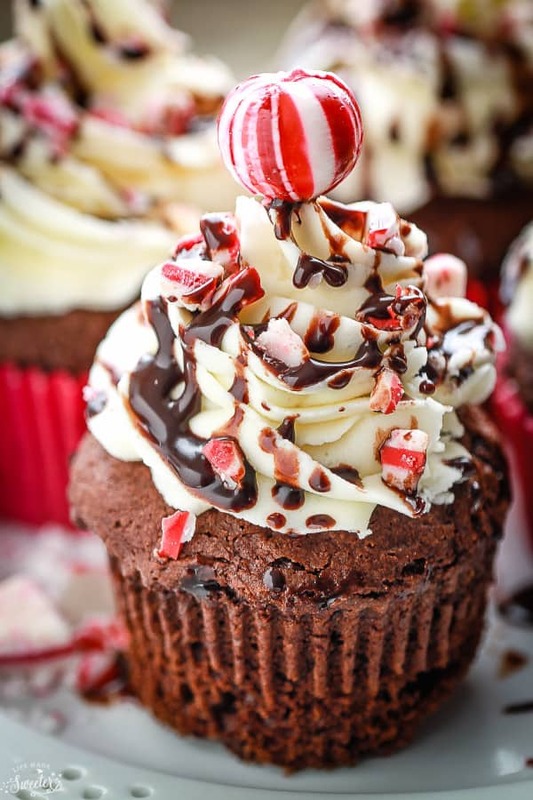 They start off with a soft and fluffy chocolate cupcake base with a hint of peppermint extract that compliments the rich chocolate flavor perfectly. A generous swirl of creamy eggnog frosting followed by drizzles of melted chocolate and a few sprinkles of crushed candy canes and Andes Peppermint Crunch Thins. Peppermint Eggnog Cupcakes combine two favorite holiday flavors making them one delectable treat! Soft & fluffy chocolate cupcakes topped with a rich & creamy eggnog frosting followed by melted chocolate drizzles & crushed peppermint chips. Preheat oven to 350°F. Line a standard muffin pan with paper cupcake liners. Make the cupcakes: In a large bowl, whisk together the flour, cocoa powder, baking powder, baking soda, sugar, and salt together. In the bowl of stand mixer or using a hand mixer, beat together the egg, milk, oil, peppermint, and vanilla. Slowly add the flour mixture and beat on medium speed with an electric mixer for 30 seconds. Scrape down the sides of the bowl and continue mixing on medium speed for 1 to 2 minutes. Add boiling water and stir to combine. Divide the batter equally into prepared muffin tin filling to about three-quarters full. Bake for 18-20 minutes or tops are firm and a cake tester inserted in the center comes out clean Remove pan from oven and allow cupcakes to cool in pan for 10 minutes. Remove cupcakes from pan and let cool completely before frosting. 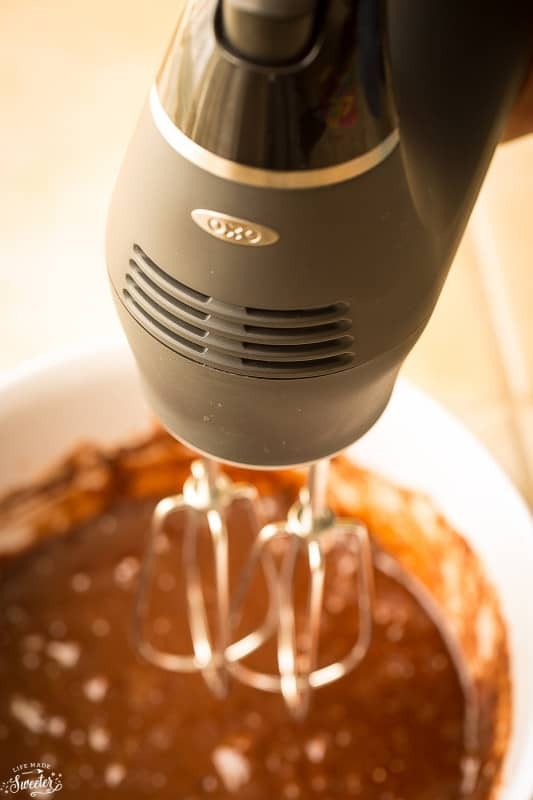 Meanwhile, make the frosting: Beat softened butter with a hand or stand mixer on medium speed. Beat for about 3 minutes until smooth and creamy. Add powdered sugar and mix until combined. Add eggnog, cinnamon, nutmeg and mix until smooth. If necessary, add more eggnog or powdered sugar until desired consistency is reached. Frost cooled cupcakes. Drizzle with melted chocolate. Top with crushed candy canes and crushed Andes Peppermint Crunch Thins right before serving. These cupcakes were so easy to whip up thanks to the new OXO Illumination Digital Hand Mixer I was able to test out recently. Although I have a stand mixer at home, there are many days I don’t feel like lugging it out or washing the large bowl. 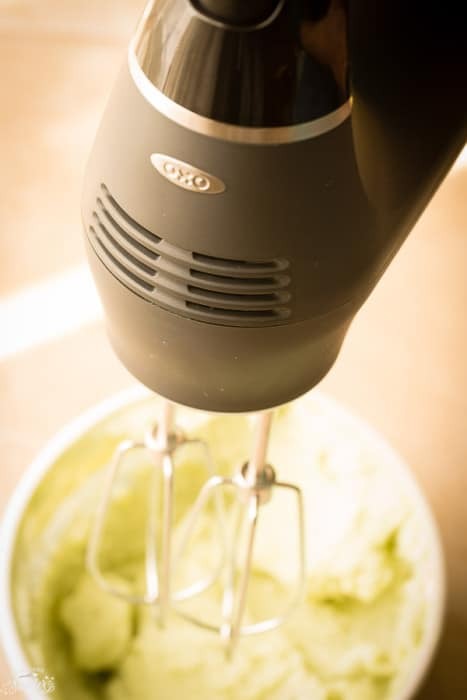 This OXO digital hand mixer is sleek, compact and packed with enough power to get your job done without a lot of effort. The beaters snap on and off for easy storage and the soft-touch controls allow you to smoothly adjust mixing speed between six speeds from light mixing to heavy whipping. The mixer also has a soft glow LED headlight which makes it super easy to see inside the bowl so you can make sure the batter is mixing consistently even when there is low lighting. It made the whole process so much easier and the cupcakes were a hit! These cupcakes are adorable, and look so delicious! Yum! We got our tree up tonight and I am in holiday season for sure!! Love that you combined eggnog and peppermint into one lovely treat! Absolutely beautiful and festive! I wish I could reach in and grab one for my breakfast, Kelly. Yay for baking season being here! Peppermint is such a classic Christmas flavour, but I don’t see it around enough. I love that you have combined it with eggnog too. I’m so excited that the holiday season is finally here, too! I’m sure your kids love that your tree is up extra early. And I’m sure they love these cupcakes, too. These are absolutely gorgeous, Kelly! Eggnog and peppermint are my two favorites for the holidays, so I can only imagine how delicious these must be! Combining eggnog and peppermint was a great idea, Kelly! These cupcakes look out of this world!! Wow! They really look Wow! I need to find or make some eggnog and try these! Kelly – your cupcakes always look amazing and like they should belong in a bakery. This one is no exception! Your house must be such a festive place at Christmastime! I have been eager to put up the tree but we manage to wait til Thanksgiving. We’re all set now and I’m off to do some wrapping. : ) I love your beautiful cupcakes. 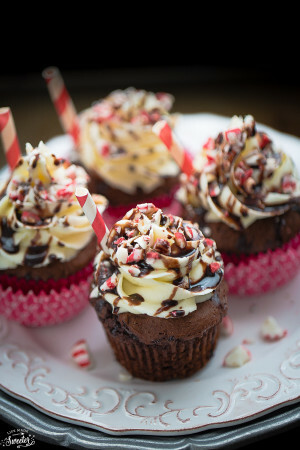 You always think x’mas cookies but cupcakes are such a special treat. The peppermint and eggnog combo is so smart. You can’t get this without making it at home and looks totally worth the effort! Wow! Your house sounds like the perfect holiday Christmas winter wonderland! These festive cupcakes are definitely getting me into the holiday spirit! Awwwww, these cupcakes look so adorable and festive, Kelly. I can imagine how delish they were. Can’t wait to try. They scream Christmas. I love eggnog and I know I will love this. It’s beautiful and would be so awesome to treat the kiddos. These are gorgeous Kelly! 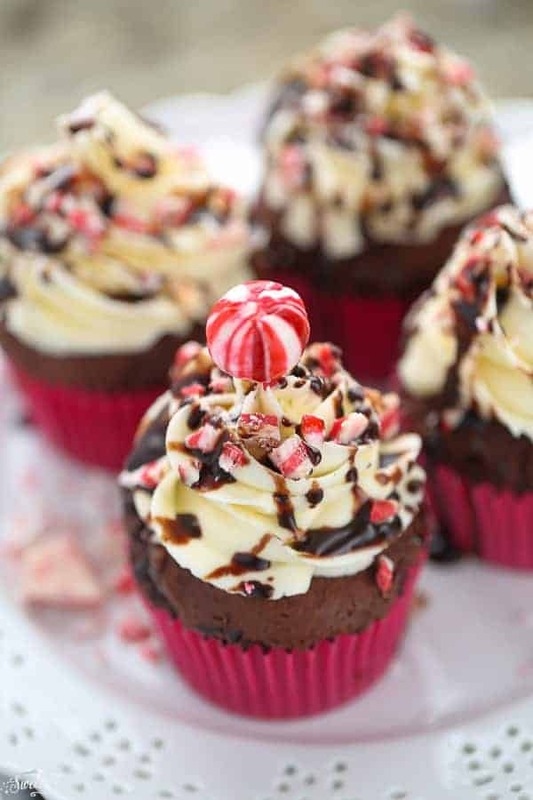 Peppermint and eggnog sounds like a wonderful combination – and nothing beats cupcakes! Yum! These cupcakes look so pretty Kelly and the peppermint and eggnog combination is perfectly Christmasy! Your husband has my husband beat when it comes to Christmas. I make fun of mine every year for putting up the Christmas tree the weekend before Thanksgiving. These cupcakes are gorgeous and screams Christmas! Your photos are stunning! I am definitely in 100% christmas mode now that thanksgiving is over and I love it! These cupcakes are just so pretty Kelly and they definitely sound delicious! I wish I had one for dessert right now! Haha, I wish my husband was as excited about Christmas as yours! He makes me wait until after Remembrance Day, but that’s as long as I’ll hold off! Lol. 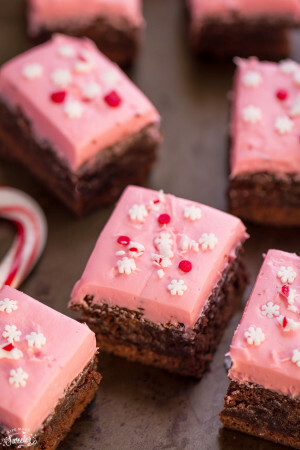 I LOVE peppermint anything — these are so fun for all the holiday gatherings! yes bring on the peppermint! These cupcakes look so festive and pretty Kelly! Pinned! Whoa! These are so fun! Never thought to pair peppermint with eggnog. Yum! OCTOBER!! I am just getting around to thinking about what to bake for the holidays. LOL These look amazingly decadent!! Peppermint and eggnog together?!!! I love these cupcakes, Kelly!! These are gorgeous, Kelly! Love the peppermint eggnog combination! You know that I can never resist a delicious cupcake! I love the combination of peppermint and eggnog flavors. They are gorgeous too, as always, Kelly! Oh my GAWWWWD these were made for me. Seriously. I usually only have one/two glasses of eggnog come Christmastime but I like putting it in ALLL the baked goods. This year will be my first year buying my own tree, I was a scrooge last year and didn’t bother and my apartment was so un-festive I vowed to change that in 2015!! Wow! 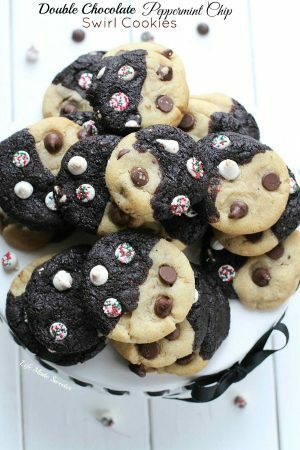 These are a perfect combination of holiday flavors! And so festive looking…of course!! These cupcakes are so gorgeous! Love the peppermint eggnog combo! I don’t think I have ever actually tasted those two together, but it sounds amazing! Pinning! Also, love your husband’s enthusiasm for Christmas! I have such a hard time waiting, so I completely understand. My mom and Ialways pulled the Christmas stuff out the day after Thanksgiving, and there were people who thought that was too early! I love baking cupcakes, they’re so fun to decorate too. I’ve never tried peppermint and eggnog together, but I love the idea! These look perfect, Kelly! Ooooh Kelly, that sounds like you’ve got Christmasville at home. Can I please come over? 😀 And those cupcakes – look and sound absolutely amazing! Peppermint+EggNog+Chocolate??? I’m all in! These look and sound scrumptious! 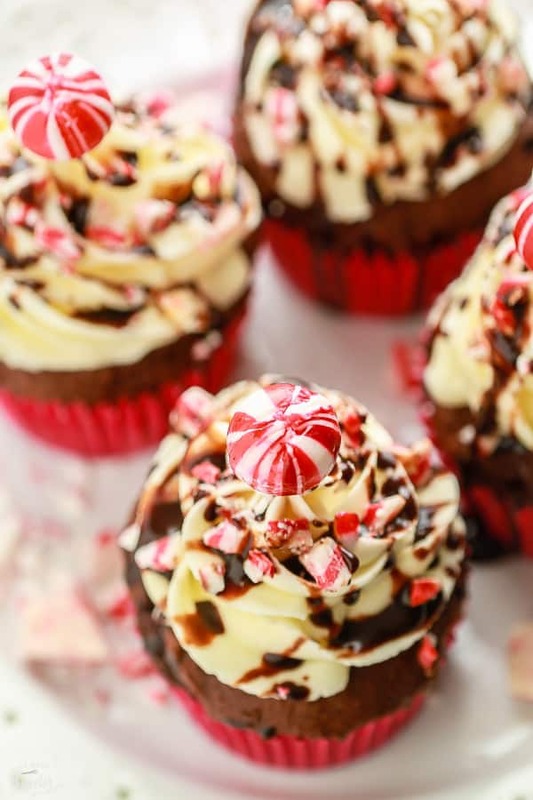 Peppermint and Eggnog in one cupcake? Oh be still my heart! I have to say, I wouldn’t necessarily think to put peppermint and eggnog together. But man, does it sound good! A crazy Christmas fest in my mouth. 😀 These are so pretty too, I love how you decorated them!! So so nice that you hubby is into Christmas. These cupcakes Kelly are simply adorable. Perfect combo flavors and looks gorge. How festive! I like getting a head start on celebrating Christmas too! Join the community and never miss a recipe. Subscribe now and receive a free eBook, low-carb meal plans, cooking tips and exclusive content right in your inbox.